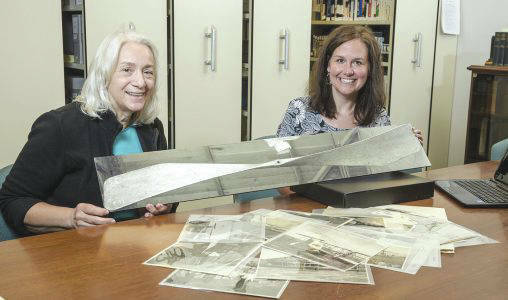 Submitted photo Dawne Dewey, head of Wright State’s Special Collections and Archives, left, and archivist Toni Vanden Bos with a photo of a 1912 Wright Flyer propeller that the university had restored. 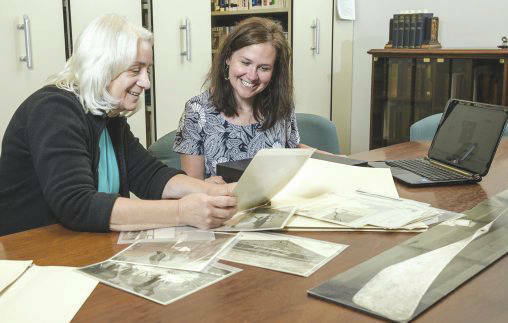 Dawne Dewey and Toni Vanden Bos examine photos from the Wright Brothers Collection in the Special Collections and Archives in Dunbar Library. FAIRBORN — When a 1912 Wright brothers propeller was removed from the Wright State University Archives at Dunbar Library, where it had been on display for 40 years, it was for a special road trip. The historic Bent End Propeller, which was losing flakes of its gray aluminum paint, was transported to a conservation laboratory in northeast Ohio to be preserved. For the staff of Wright State’s Special Collections and Archives, it was an emotional moment. “All of us followed them down the elevator and out to the van like we were saying goodbye to a child going off to college,” said Dawne Dewey, head of the archives. After 10 months of conservation work, the propeller has been returned to its home. And the Special Collections and Archives plans to throw an official Propeller Party in October to unveil the newly preserved artifact to the campus community and public by putting it back on display at the Archives, which houses the largest Wright brothers collection in the world. The public Propeller Party will be held Thursday, Oct. 4, from 5 to 7 p.m. in the Special Collections and Archives. Early in their 1904 test flights at nearby Huffman Prairie, the Wright brothers realized that their round-end, straight propellers were not producing as much thrust as the math said they should. So they carved a set of bent-end propellers for the 1905 Flyer and found that they increased the thrust. Bent-end propellers were used on all Wright aircraft up until 1916, including the Model C standard production airplane in 1912. After the Special Collections and Archives received the Wright brothers collection in the 1970s, people began donating additional artifacts, including a 1905 propeller and the 1912 Bent End Propeller. The 1912 Bent End Propeller was donated in 1978 by William Eicher, who lived in Dayton. It was appraised at the time as being worth $5,000. Eicher’s connection to the Wrights and how he came to be in possession of the propeller is unclear. The wooden propeller was mounted on an oak board and displayed on a wall in the Reading Room of the Archives. However, the propeller began to deteriorate over time. So a crowdfunding campaign was launched to pay for the cost of preserving the artifact. With a catchy slogan of “Protect the Propeller,” the campaign included videos featuring Wright State President Cheryl B. Schrader and the Wright State baseball team as well as a social media blitz. “We knew we had an audience for this because of the aviation community,” said Dewey. Ultimately, the $7,600 cost of restoration was covered by private contributions, including donations from the National Aviation Heritage Alliance and the Wright Family Foundation. Wright State archivist Toni Vanden Bos handled the arrangements that led to conserving the propeller. “We wanted to balance the historical with the aesthetic — preserving the propeller but letting its surface tell its history,” she said. Last October, the propeller was wrapped in plastic and transported to the McKay Lodge Art Conservation Laboratory near Oberlin, Ohio. Treatment of the propeller included surface cleaning and stabilizing the cracking paint that had begun to lift off of the ends of the propeller due to changes in temperature and humidity. The soiling of the propeller was only reduced, not eliminated, to preserve its original look. The artifact was then varnished to recreate the sheen of the previous gloss layer and to provide a protective barrier that allows the propeller to be more easily cleaned and maintained in the future. Dewey says the propeller is an aviation treasure that helps bring alive the accomplishments of the Wright brothers a century ago. “It’s a way for us to connect to the past,” she said. https://www.fairborndailyherald.com/wp-content/uploads/sites/50/2018/09/web1_1912-Wright-Flyer-propeller-20374_020-508×300.jpgSubmitted photo Dawne Dewey, head of Wright State’s Special Collections and Archives, left, and archivist Toni Vanden Bos with a photo of a 1912 Wright Flyer propeller that the university had restored. https://www.fairborndailyherald.com/wp-content/uploads/sites/50/2018/09/web1_1912-Wright-Flyer-propeller-20374_016-508×323.jpgDawne Dewey and Toni Vanden Bos examine photos from the Wright Brothers Collection in the Special Collections and Archives in Dunbar Library.